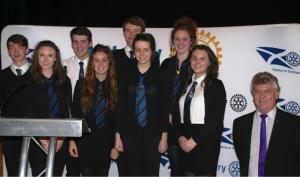 Rotary Club of Dalbeattie - welcome! Please scroll/swipe down through this page to find out more about us, in addition to the pages linked in the menu, top-left. The competitors at the Young Chef Competition: In no particular order Lloyd Pipe, Joe Pagan Lennon McCubbin, Bailey Hodgson & Claire Orr. Remember everyone our Christmas Dinner is being held in the Kings Arms Hotel on the 22nd December 6.30 for 7pm. 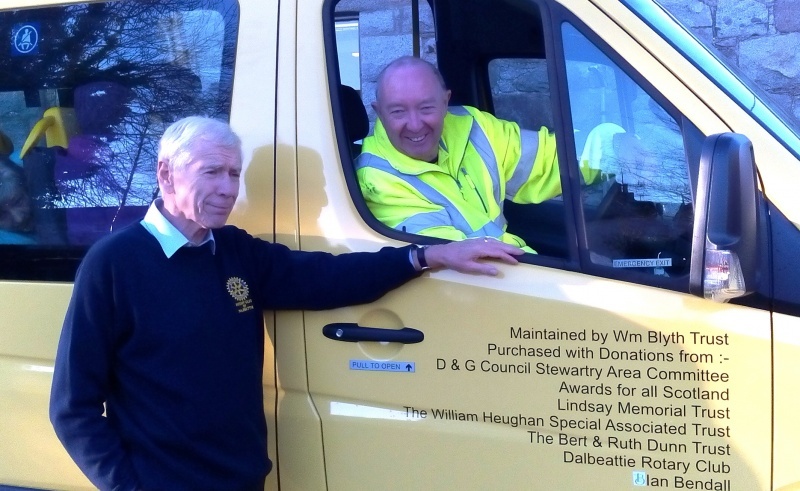 Fraser Sanderson, the Rotary Club’s representative on the Management Committee of Dalbeattie Day Centre, is pictured with min - bus driver Keith Dickie, at the launch event held on 24th November to celebrate the arrival of the Centre’s new bus. 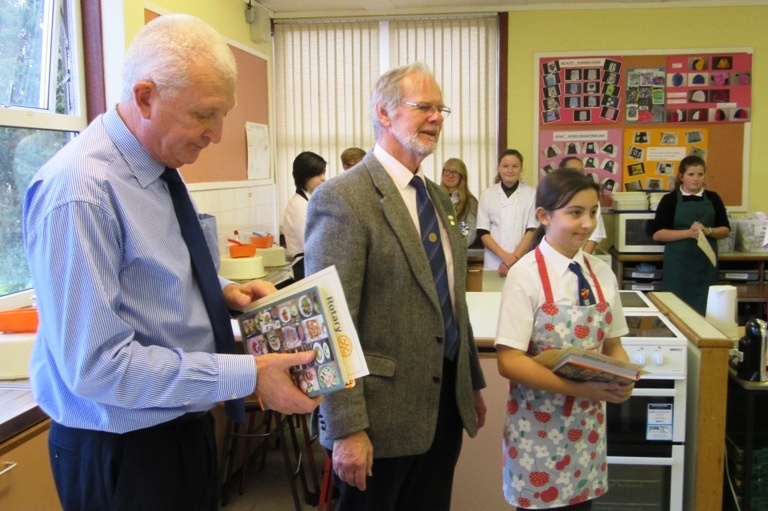 The two winners of our Club round, Alice Maxwell and Georgia Johnston, were among the ten Young Chefs, representing five of the Area’s Rotary Clubs, who gathered at Kirkcudbright Academy to compete for two places in the District final in Livingston. For full report and more photographs go to our "Youth Opportunities" page. 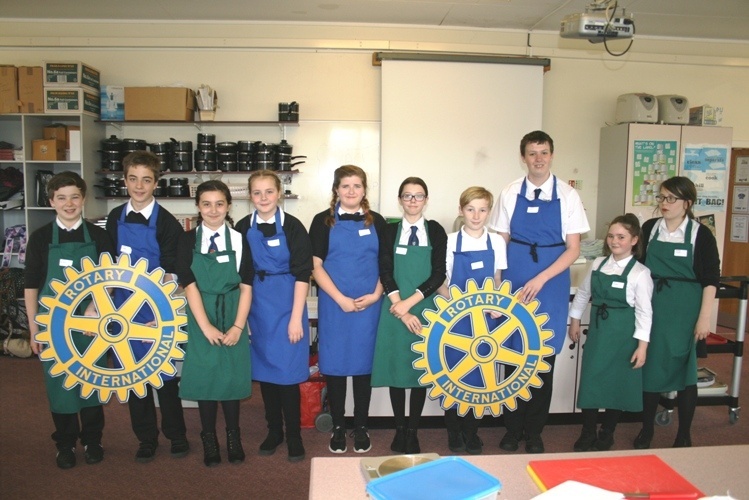 On the afternoon of Friday 11th October ten Dalbeattie High School pupils took part in the Rotary Young Chef competition. Five local Rotarians were present, and did their best to help with the tasting. 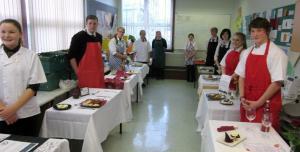 It was agreed that overall the quality of their preparation, cooking and presentation were in advance of anything that had been seen in previous years. 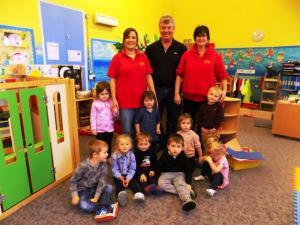 For the full report and more photographs go to our "Youth Opportunities" page . The Rotary Crocus is one of the leading international fundraisers for the END POLIO NOW campaign. Since 2012 Rotary Crocuses have raised around Â£1,000,000 and been distributed in 15 countries. They are an easy way for every Club to reach out to the community both to raise funds and awareness for END POLIO NOW. 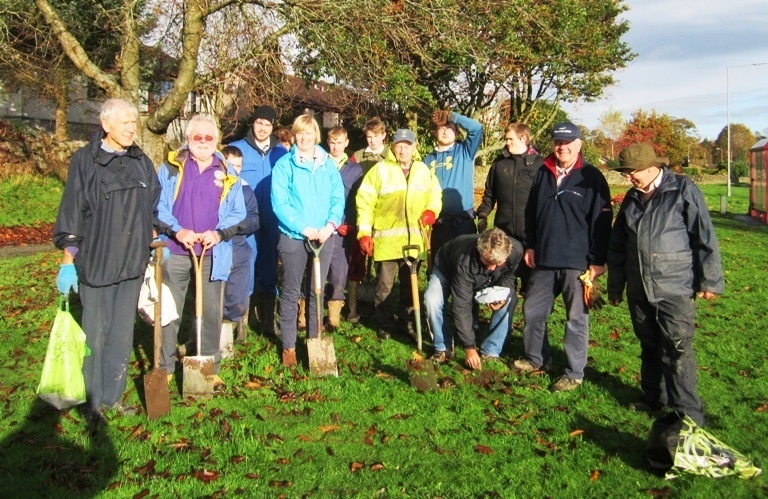 On Friday 4th November Dalbeattie Rotary Club played their part in this campaign when a large number of Rotarians and friends, assisted by students from Dalbeattie High School planted 5,000 purple crocus corms at the Dumfries entrance to Dalbeattie. Next spring remember and look out for these 5,000 purple crocuses on the broad grass verge just beyond the entrance to Johnston Drive. On Thursday 22 September Rotarians and partners gathered in Dalbeattie & KirkgunzeonParish Church Hall to obtain trainingin the effective use of CPR and also how to operate a defibrillator. 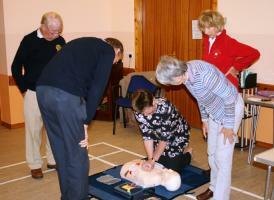 The training was given by Amanda Macaulay who is the local coordinator of First Responders, despite the photographs no Rotarians were injured during the evening’s practical demonstrations. At the end of the busy evening the Rotary Club presented Amanda with a cheque for Â£500:00 part of our Club’s ongoing support of First Responders. For more photographs visit our "Community" Page. On the evening of 8th September, Club members and partners visited the Dalbeattie Museum and presented Life President Tommy Henderson with a cheque for Â£500. This amount was the proceeds of a Whist Drive run in Dalbeattie by the Club earlier in the year. Guests were then given a tour of the Museum which was founded in April 1993 by Tommy who explained future plans and how the cheque would help expedite refurbishment and expansion. The photograph below shows Tommy Henderson on the right accepting the cheque from Club President Gordon Cathro. The new Rotary Year is underway with our new team in place. President Gordon Cathro continues for a second year with the support of Senior Vice President. Ian Lumsden and Junior Vice President, Robert Kennedy. 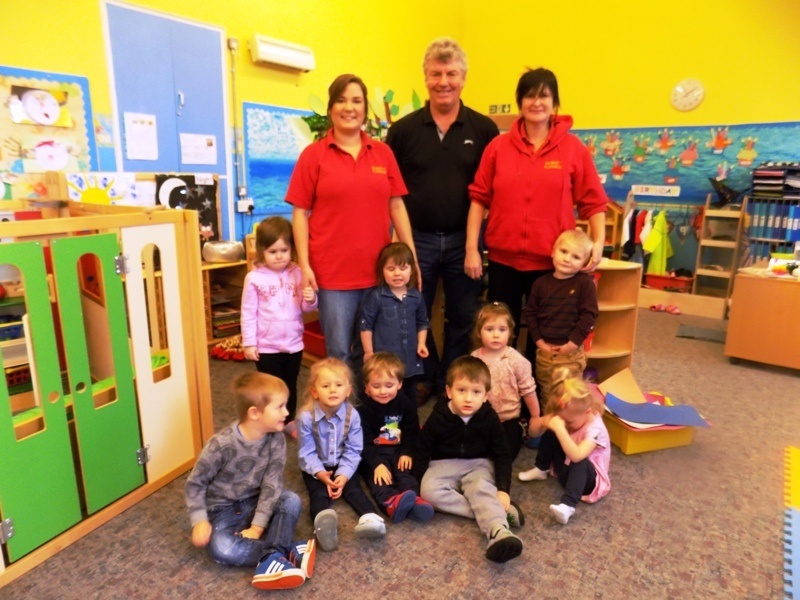 Following avery successful term of office last year, Gordon is again stressing the need to have a year of fun as we continue to make a difference in the life and activities of the Dalbeattie community, as we have been doing for the last 40 years. 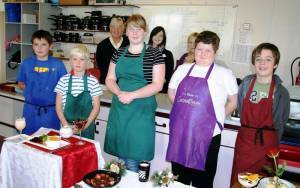 The Rotary Club of Dalbeattie and District has been serving the local community for over 40 years since it was established in May 1976. To celebrate this proud achievement, President Gordon Cathro and 46 current and past Club members and wives held a garden party on Saturday 2nd July. 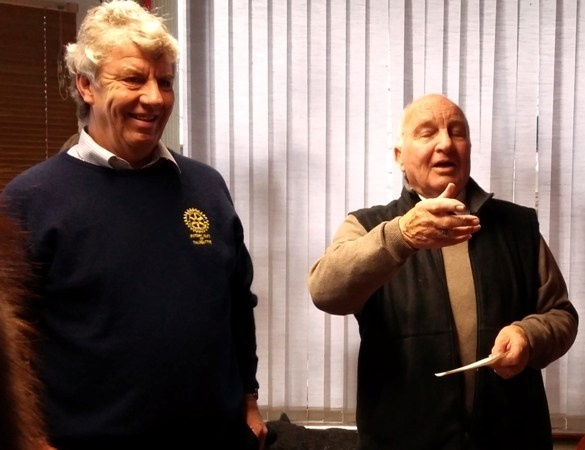 The highlight of the afternoon was without doubt the presentation by President Gordon of certificates to two founder members, John Knox and Alec Scott, who are still active members of the Club. The cool blustery weather did not dampen the spirits and much fun was had by all. Hot dogs, burgers and chicken skewers, served by the new local enterprise, Brigston & Co. along with desserts prepared by members’ wives, went down a real treat. 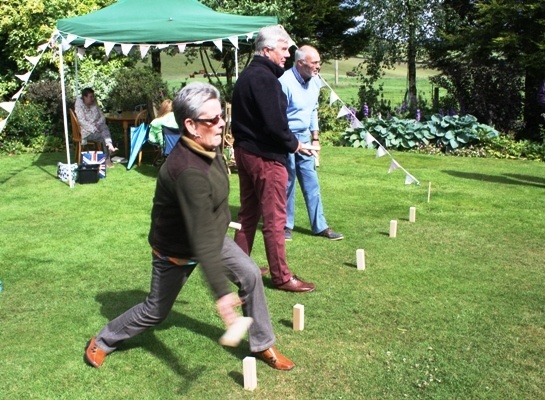 In between the squalls, members and guests were able to test their skills in a range of outdoor games including croquet, skittles and boules. 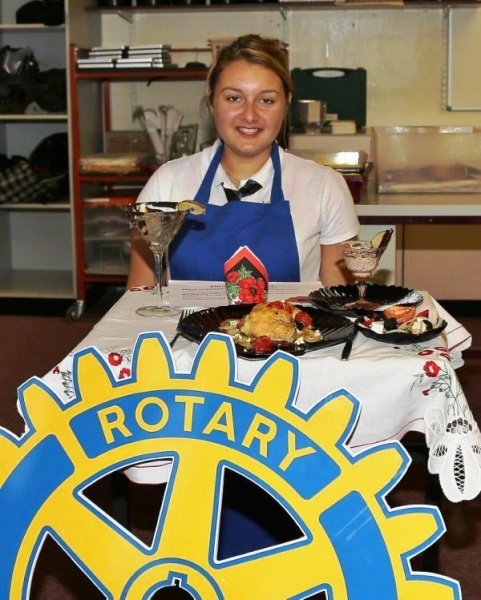 Over the past 40 years, our Rotary Club has helped many local organisations and individuals with funding and the input of Club members’ time and experience to achieve their own aims and objectives. Our activities last year demonstrate very well hoe the Club has embraced the Rotary theme “We’re for Communities”. We have provided financial support of some Â£13,000 for the following projects and organisations. Brite Hopes, a mobile eye clinic in S. Africa; Marie Curie; Dalbeattie Hardrock Challenge; Prostate Scotland ; Dalbeattie Playgroup; Dalbeattie Sea Cadets; Helping Hands, a Sri Lanka. Project; Dalbeattie & Kirkgunzeon Parish Church; Dalbeattie Christmas Lights; Dalbeattie Day Centre, funds towards the purchase of new mini bus; Dalbeattie Men’s Shed; First Responders, the purchase of a defibrillator and annual running costs. The Club also works very closely with support for local schools in the form of Career interviews, Challenge Enterprise, Peace Ambassadorial Training, Young Chef, Young Musician, Primary School Quiz, Kids Out & Young Carers. 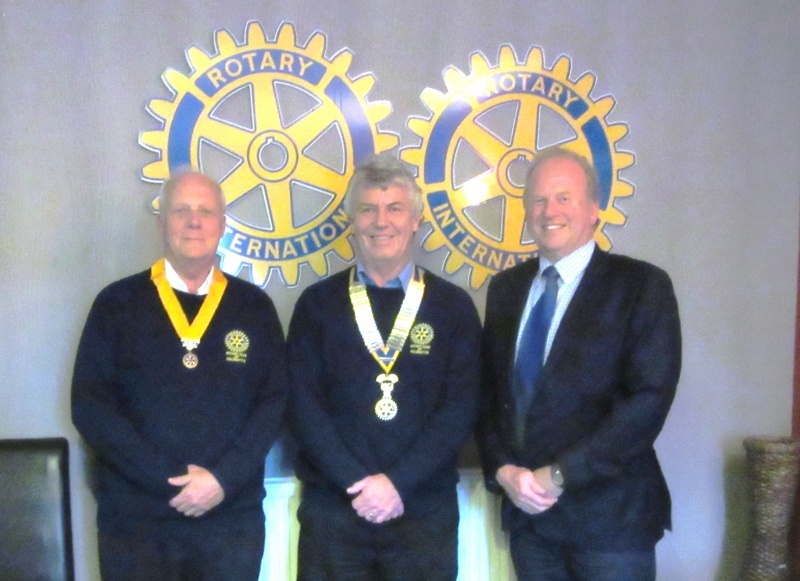 On a broader fund the Club has also supported overseas projects including the Rotary International drive to eliminate polio worldwide through our contribution to Polioplus. This Rotary year the Club donated Â£300 for vital equipment. 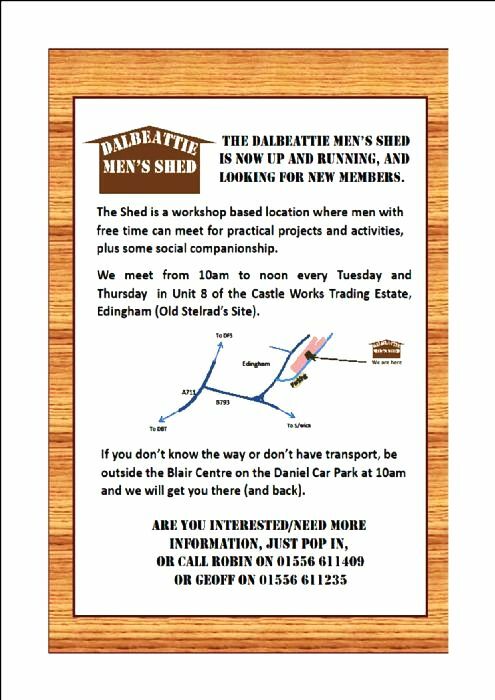 Dalbeattie Rotary Club has been developing the idea of establishing a Men's Shed here in Dalbeattie. The Men's Shed is usually a workshop-type of place where men with free time can come together for projects, activities and a good laugh. You will find lots of information on this project by clicking the "What Do We Do" button at the top of this website. Stephen Howie will be addressing the Club. A guest speaker will address the Club - this has yet to be finalised. Brian Atwell will be addressing the Club. Charles Cloy will be addressing the Club. DALBEATTIE DG5 4HA 01556 610400.